United's DRAIN DRAGON Catch Basin Insert will protect the drain passages by capturing hydrocarbons, dirt, sand and other contaminants as they enter the storm drains. This product is designed for use with combination catch basings with street grates as well as for curb openings. The heavy-duty tension rods secure the DRAIN DRAGON inside the curb inlet, which prevents sediment and other contaminants from entering the curb portion of the storm drain. Collects oil, fuel and other polluants left by vehicles. Captures oil and other contaminents, keeping them from entering storm drains. Collects eroded soils, silt and other debris. 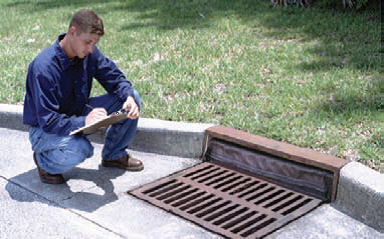 Fits grate sizes up to 40" x 40" and curb inlets up to 60" wide. All DRAIN DRAGONS help to comply with NPDES, 40 CFR 122.26 (1999) and Total Maximum Daily Load (TMDL) requirements. All DRAIN DRAGON systems feature a 100% customer satisfaction guarantee for the life of the product. To learn more about these available stormwater equipment, contact your local United Sales/Service Representative or click here and someone will contact you as soon as possible.